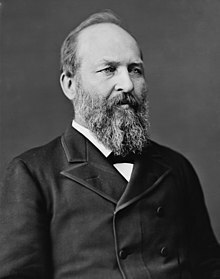 After serving 18years in the US House of Representatives, James Garfield was elected as the 20th President of the United States. He was notable for expanding executive authority, ramping up American naval power, streamlining the US Post Office and appointing a number of African-Americans to federal office. As a Radical Republican, Garfield supported many of the principles of the party, but pushed for civil rights for African-Americans. This created a rift between his presidency and many of his own party. On July 2, 1881, Charles J. Guiteau, a major supporter denied a political office, shot him with a revolver. Although initially surviving the gunshot, many medical professionals believe that his attending physicians infected him with dirty instruments and hands while trying to remove the bullet. He died in office on September 19, 1881, having served only 200 days.